When you really think about it, it’s almost surprising how much of the work done in warehouses takes place on pallet racks. 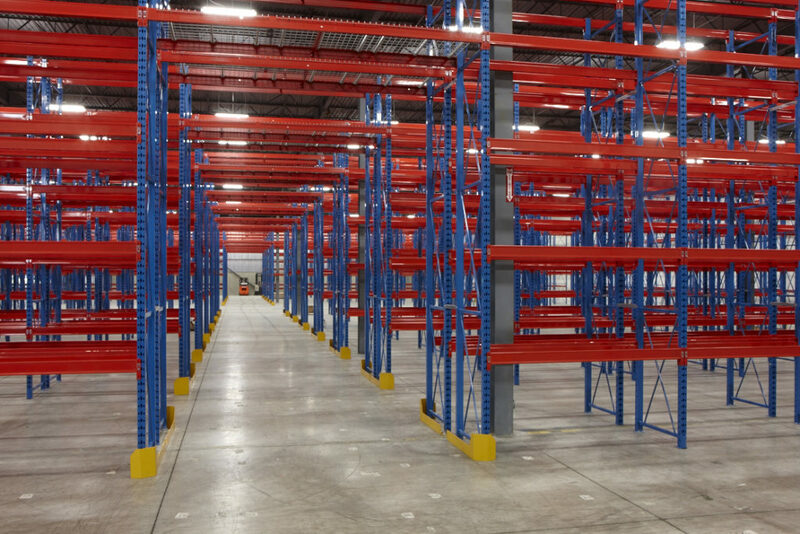 It makes sense—warehouses aren’t typically in the business of storing individual items except in special cases, and pallet racks are an easy way to expand your storage capacity and safely store heavier goods and/or larger selections of items. The easiest way to prevent damage to your pallet racks and work to keep your inventory safer is by using pallet rack safety guards. These guards function as a ‘gate’ of sorts between the pallet rack and the area around it, and can help stop falls, accidental forklift collisions, and much more. Use these wherever possible, and if budget/space is an issue focus on the racks in your highest-traffic areas first to reduce collision risk. Keeping an eye out for these and other obviously visible signs of damage will be an easy way to prevent further damage and avoid costly replacements down the line. Even above and beyond mishandling of items and weight capacities, a common source of pallet rack damage is collisions in crowded aisleways. A careful balance needs to be struck between traffic flow and aisle width, and making sure your aisles are wide enough to accommodate both foot and vehicle traffic will help work get done more smoothly while working to prevent collisions between workers, forklifts, and your warehouse storage equipment.